Nutrition professionals must recognize obesity as a chronic disease with the potential for relapse and weight regain, and that these will be perpetual challenges to weight loss after bariatric surgery intervention.5 The inaccurate belief that bariatric surgery is a miracle cure for obesity must be corrected. To reach and maintain optimal weight loss, it’s essential that individual barriers are addressed and bariatric patients continue with regular follow-ups and interventions.6 Early intervention often can reduce patient risk of regaining a significant amount of weight.7 For the patient who has had previous bariatric surgery with inadequate weight loss and/or weight regain and later seeks revision or conversion surgery (eg, gastric band to sleeve, revision to existing sleeve, sleeve to gastric bypass), the role of the RD in the patient’s experience is also critical. This continuing education course reviews the determinants of inadequate weight loss and/or weight regain after bariatric surgery. Early intervention by bariatric RDs who can identify the determinants of regain often can reduce patient risk of significant weight regain and also assist in patient selection for candidates seeking revision or conversion surgeries. Some patients may lack support or face disapproval about their choice to have surgery from significant others, family members, friends, and colleagues. Those who choose not to publicly disclose the decision to have bariatric surgery may find lack of understanding and support from significant others. These patients should be encouraged to attend support groups or seek psychological counseling to assist them with their weight loss journey. Patients may be inadequately prepared to make the major nutrition and eating behavior changes necessary for optimal weight loss after bariatric surgery, despite ample nutrition education before surgery. The bariatric patient’s nonadherence to nutrition recommendations can influence both short- and long-term weight loss due to excessive energy intake, inadequate micronutrient supplementation, and/or lack of physical activity.6 For those patients seeking a revision or conversion, the bariatric team members, including the RD, should determine how the patients have changed their expectations, habits, and behaviors in anticipation of the second surgery. What did not work for the patients the first time? What has changed? Though nutrition education and counseling continues to be key, the importance of a skilled behavioral health practitioner can’t be emphasized enough when discussing a multidisciplinary team approach in the bariatric setting. For those RDs with career aspirations in this setting, additional training in behavioral health or behavioral health nutrition is recommended. 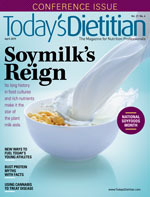 To avoid “soft food syndrome” after bariatric surgery, patients should be encouraged to reintroduce solid foods in an appropriate texture progression for greater satiety and nutrition composition.6 Some patients hesitate with solid food progression due to fear of stalled weight loss, pain, nausea, or vomiting.6 However, these patients should be advised that remaining on less-filling liquids and puréed foods can limit satiety and resulting weight loss. Education and follow-up are key to the prevention of weight regain after bariatric surgery.7 Early identification of and counseling for nutrition, behavioral, and exercise barriers can spark a loss of the gained weight and resumption of weight maintenance.7 The continuing role of RDs in bariatric practice settings provides support and stability to patients who experience a return to preoperative unhealthful habits and regain. Incorporating relapse prevention skills used in traditional addiction recovery programs can be useful when working with bariatric patients postoperatively. Patients experiencing weight regain may feel ashamed or embarrassed that they’ve “failed” and may be reluctant to return to any member of the bariatric team; by reaching out to the patient in a compassionate and nonjudgmental way, the RD can offer support along with effective intervention to help the patient get back on track. Providing simple guidelines to patients about helpful eating techniques can ease the transition to a new eating style after surgery.6 Mindful eating practices should be encouraged, including eating slowly, chewing foods well, and avoiding distractions from meals (eg, television, computer, and reading) to allow complete focus on feelings of fullness and satisfaction.6 Patients are encouraged to downsize to smaller plates, bowls, and eating utensils to help control portion sizes, and drinking any fluids with meals is discouraged.6 In general, patients should wait 30 minutes after eating before drinking fluids. While many of these eating techniques will make sense to patients because they relate to reduced stomach size and limited portion control, RDs also have several opportunities to help patients practice behavior modification as well. Support groups before and after bariatric surgery should promote an environment in which patients feel safe and comfortable, whether they’re doing well or struggling.7 Patients who feel welcomed and not judged when experiencing weight regain are more likely to attend support groups sooner, allowing for earlier interventions.7,27 Patients experiencing regain would benefit from support-group topics that focus on self-efficacy (ie, confidence in achieving and maintaining weight loss), avoidance of transfer addiction (ie, substituting one addictive behavior for another), and relapse prevention skills and education. Patients with weight regain may have different needs than bariatric patients without regain and could benefit from separate behavioral interventions to target dietary nonadherence, disordered eating practices, or stress reduction following surgery.15 A 2015 pilot study by Himes and colleagues targeted dietary nonadherence, management of clinically relevant stressors, and reduction of grazing, binge eating episodes, and alcohol use using a combination of cognitive behavioral therapy and dialectical behavior therapy.11 In the study, these treatments were expected to improve behavioral nonadherence with professional recommendations, stress management, and psychoeducation, and results showed that a combination of cognitive behavioral and dialectical behavior therapies helped jump-start weight loss, decrease grazing and binge eating behaviors, and slightly improve mood.11 These results suggest that offering support groups led by professionals trained in these therapies may be helpful interventions for patients experiencing weight regain. Patients who choose bariatric surgery must be educated to understand that obesity is a chronic disease; surgery is a tool to achieve significant weight loss, but inadequate postoperative adherence to recommendations can override that tool’s efficacy, leading to weight regain.7,10 RDs have a critical role in educating and counseling patients about following postoperative nutrition guidelines and should monitor patient anthropometrics closely for prevention of weight regain.8 RDs can optimize long-term weight loss by ensuring patients understand their selected bariatric procedures (including limitations), offering education before and after surgery, reinforcing patients’ use of self-monitoring skills, monitoring and tailoring nutrition supplementation, encouraging mindful eating practices and 60 minutes of daily physical activity, and providing supportive, nonjudgmental follow-up.6 After identifying factors that may contribute to regain, RDs can assist with patient care coordination to find appropriate solutions to help the patient cope with stressful relapse triggers.8 For long-term weight loss maintenance and prevention of weight regain after bariatric surgery, patients need continuous support from multidisciplinary teams to manage emotional eating, sedentary habits, and relapse to previous maladaptive behavior patterns. — Mireille Blacke, MA, LADC, RD, CD-N, is an adjunct professor at the University of Saint Joseph in West Hartford, Connecticut; bariatric program coordinator at the Bariatric Center at Saint Francis Hospital in Hartford, Connecticut; and a freelance health and nutrition writer. 1. Demonstrate the role of the RD in the prevention of weight regain after bariatric surgery. 2. 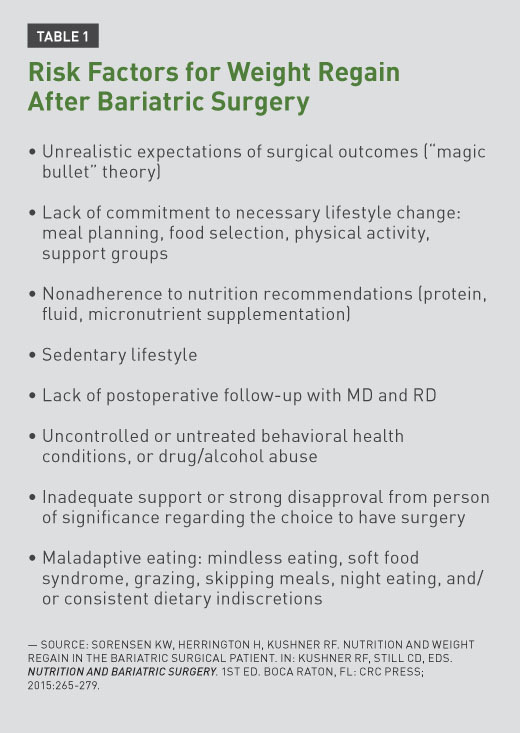 Evaluate the impact of nonadherence to nutrition recommendations on short- and long-term weight loss and risk of weight regain after bariatric surgery. 3. Assess the maladaptive and disordered eating patterns that may contribute to weight regain after bariatric surgery. 1. The primary definition of disinhibition is which of the following? 2. In bariatric surgery patients with binge eating disorder, what is the most predictive feature of weight regain? 3. Which of the following is the common underlying mechanism between binge eating, grazing, and disinhibition? 4. What is the estimated prevalence of grazing after bariatric surgery? 5. Patients should be encouraged to reintroduce solid foods in an appropriate texture progression to avoid which of the following behaviors or conditions? 6. Night eating syndrome is marked by which of the following symptoms? 7. Which of the following is an appropriate nutrition recommendation for a postoperative bariatric surgery patient who’s eating solids? a. Separate solids and liquids by 60 minutes. Wait 60 minutes before and after you eat before you drink. b. Separate solids and liquids by 30 minutes. Wait 30 minutes after you eat before you drink. c. Drink fluids first with each meal and snack. d. Eat two meals, including breakfast, plus two snacks per day. 8. Weight regain after bariatric surgery is most likely due to which of the following problems? 9. Which of the following strongly predicts weight regain after bariatric surgery? 10. Given the possibility of symptom substitution and transfer addiction after bariatric surgery, which of the following skills/strategies in preoperative nutrition visits may be helpful in preventing weight regain? 1. Bastos EC, Barbosa EM, Soriano GM, dos Santos EA, Vasconcelos SM. Determinants of weight regain after bariatric surgery. Arq Bras Cir Dig. 2013;26(Suppl 1):26-32. 2. Blomain ES, Dirhan DA, Valentino MA, Kim GW, Waldman SA. Mechanisms of weight regain following weight loss. ISRN Obes. 2013;2013:210524. 3. Stewart KE, Olbrisch ME, Bean MK. Back on track: confronting post-surgical weight gain. Bariatr Nurs Surg Patient Care. 2010;5(2):179-185. 4. Meany G, Conceição E, Mitchell JE. Binge eating, binge eating disorder and loss of control eating: effects on weight outcomes after bariatric surgery. Eur Eat Disord Rev. 2014;22(2):87-91. 5. Westerveld D, Yang D. Through thick and thin: identifying barriers to bariatric surgery, weight loss maintenance, and tailoring obesity treatment for the future. Surg Res Pract. 2016;2016:8616581. 6. McGrice M, Don Paul K. Interventions to improve long-term weight loss in patients following bariatric surgery: challenges and solutions. Diabetes Metab Syndr Obes. 2015;8:263-274. 8. Valentine K. Options for treating weight regain after Roux-en-Y gastric bypass. Weight Manag Matters. 2014;12(4):5-7. 9. Pouwels S, Wit M, Teijink JA, Nienhuijs SW. Aspects of exercise before or after bariatric surgery: a systematic review. Obes Facts. 2015;8(2):132-146. 10. Sorensen KW, Herrington H, Kushner RF. Nutrition and weight regain in the bariatric surgical patient. In: Kushner RF, Still CD, eds. Nutrition and Bariatric Surgery. 1st ed. Boca Raton, FL: CRC Press; 2015:265-279. 11. Himes SM, Grothe KB, Clark MM, Swain JM, Collazo-Clavell ML, Sarr MG. Stop regain: a pilot psychological intervention for bariatric patients experiencing weight regain. Obes Surg. 2015;25(5):922-927. 12. Lynch A. Eating disorders and bariatric surgery. Weight Manag Matters. 2012;10(1):1, 22-23. 13. Odom J, Zalesin KC, Washington TL, et al. Behavioral predictors of weight regain after bariatric surgery. Obes Surg. 2010;20(3):349-356. 14. Kofman MD, Lent MR, Swencionis C. Maladaptive eating patterns, quality of life, and weight outcomes following gastric bypass: results of an internet survey. Obesity (Silver Spring). 2010;18(10):1938-1943. 15. Kalarchian MA, Marcus MD, Wilson GT, Labouvie EW, Brolin RE, LaMarca LB. Binge eating among gastric bypass patients at long-term follow-up. Obes Surg. 2002;12(2):270-275. 16. Ivezaj V, Kessler EE, Lydecker JA, Barnes RD, White MA, Grilo CM. Loss-of-control eating following sleeve gastrectomy surgery. Surg Obes Related Dis. 2017;13(3):392-398. 17. Ivezaj V, Barnes RD, Cooper Z, Grilo CM. Loss-of-control eating after bariatric/sleeve gastrectomy surgery: similar to binge-eating disorder despite differences in quantities. Gen Hosp Psychiatry. 2018;54:25-30. 18. Hillstrom K, Avila NM. BED, bulimia in bariatric surgery patients. Today’s Dietitian. 2014;16(1):12-18. 19. Johnson Stoklossa C, Atwal S. Nutrition care for patients with weight regain after bariatric surgery. Gastroenterol Res Pract. 2013;2013:256145. 20. Allison KC, Wadden TA, Sarwer DB, et al. Night eating syndrome and binge eating disorder among persons seeking bariatric surgery: prevalence and related features. Obesity (Silver Spring). 2006;14(Suppl 2):77S-82S. 21. Segal A, Kinoshita Kussunoki D, Larino MA. Post-surgical refusal to eat: anorexia nervosa, bulimia nervosa or a new eating disorder? A case series. Obes Surg. 2004;14(3):353-360. 22. Sousa P, Bastos AP, Venâncio C, et al. Understanding depressive symptoms after bariatric surgery: the role of weight, eating and body image. Acta Med Port. 2014;27(4):450-457. 23. Conason A, Teixeira J, Hsu CH, Puma L, Knafo D, Geliebter A. Substance use following bariatric weight loss surgery. JAMA Surg. 2013;148(2):145-150. 24. Mechanick JI, Youdim A, Jones DB, et al. 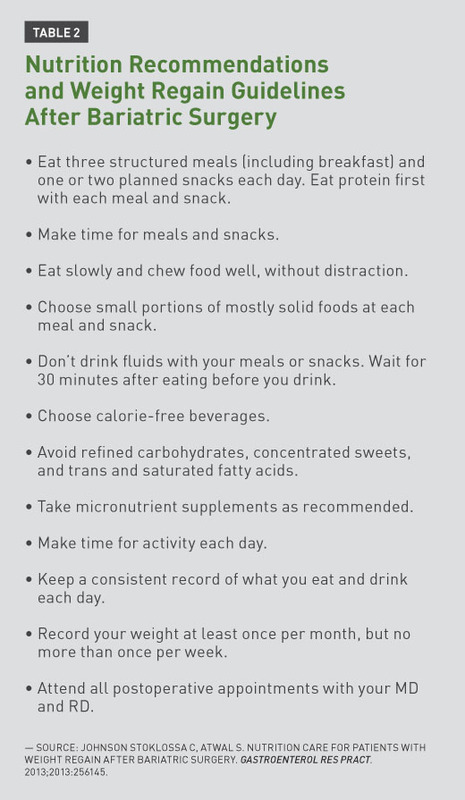 Clinical practice guidelines for the perioperative nutritional, metabolic, and nonsurgical support of the bariatric surgery patient—2013 update: cosponsored by American Association of Clinical Endocrinologists, the Obesity Society, and American Society for Metabolic & Bariatric Surgery. Surg Obes Relat Dis. 2013;9(2):159-191. 25. Sarwer DB, Faulconbridge LF, Steffen KJ, Roerig JL, Mitchell JE. Bariatric procedures: managing patients after surgery. Curr Psychiatr. 2011;10(1):19-A. 26. Faria SL, de Oliveira Kelly E, Lins RD, Faria OP. Nutritional management of weight regain after bariatric surgery. Obes Surg. 2010:20(2):135-139. 27. Sodus MB. The art of facilitating successful bariatric surgery support groups for positive changes. Weight Manag Matters. 2015;14(1):2-4.